I built this bench in 1995 when I started to get serious about my woodworking. I was using the bench my grandfather made, 2 slabs of Douglas fir, with a leg vise, attached to the posts of his workshop with large drawers beneath the top. I can't tell you how many toys I made on this bench when I was a kid, using the tools that he had owned and were just laying around the shop abandoned. In 1995 I saw an episode of The Woodwright's Shop where Roy Underhill built a bench with folding legs. His bench was based on one from The Handyman's Book, by Paul Hasluck, which used a regular metal vise. Roy dispensed with the metal vise, instead he added an apron front (borrowed from Nicholson's English bench) with a holding crochet (borrowed from Roubo's French bench) so that one could use holdfasts to clamp wood. Roy used a bench dog with metal teeth for the top of the bench, I don't-I have a bench stop made from a board attached to the end of the bench with hanger bolts and wing nuts making it easy to adjust the height of the stop. Now, for the shocking part of my bench-the entire bench, top and the legs, with the exception of the leg stretchers which are red oak, are made from incense cedar. Incense cedar (Calocedrus decurrens) is one of the most beautiful trees that grows in Northern California. It was used extensively for fence posts (my grandfather split posts for extra money) because the heartwood is very resistant to rot and for many years was used in the manufacture of pencils. Unfortantely, most of the old growth cedar is gone, another victim to over-logging practices. The tree that made this bench is from my property, it was up on the hill near the horse corrals. The top was dead, cedars often fall victim to a root fungus (spp. annosus) that can kill the tree quickly, within 2 weeks or it can take years for the tree to die. In 1994, I felled the tree and milled it with a chainsaw equipped with a Granberg Alaskan Mill attachment. It took about 3 days to mill the entire tree. I counted the growth rings of the stump when I was done and the tree was born circa 1847, the same year my great-grandfather was born, it was a seedling at the time of the California Gold Rush. That means it was not an old growth tree when it fell, the definition of old growth in California is any tree that was mature (150-300 years old) when the first '49'ers arrived in the region. In 1995, I went back to work at Rocky Mountain National Park and I wanted to have a work bench that I could take with me. Thanks to Roy Underhill and a stack of cedar in the woodshed, I made a traveling workbench. I have made folk fiddles, dulcimers and guitars, assembled chests and windsor chairs on it and I can't tell you how much musical instrument wood I have ripped that was held in that crochet and holdfast. I have never missed a "real" vise on this bench, I am so use this bench I don't know if I can use any other bench. It is not a large bench, it's five feet long, two feet wide and not very heavy, I put 2 50lb. bags of sand on the stretchers on each leg tower. Ever year I contemplate building new legs for it out of cedar or oak from trees on the property and, of course, I dream about making a copy of Nicholson's English bench. For me, the Nicholson bench is the ultimate bench because I use the same basic bench. The point I am trying to get around to is to make the bench that you have always wanted. 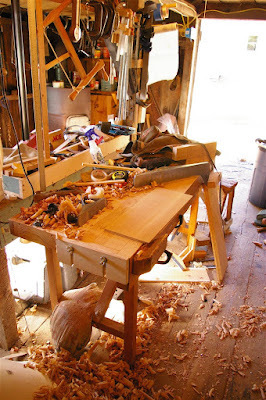 Don't get hung up on what kind of wood to use or how many vises it needs, start with a simple bench and discover what it is that you really need a workbench to do for you. Great ideas for benches can be found in Scott Landis's workbench book, The Workshop by Scott Gibson and check out Chris Schwarz's new book on making workbenches. Please, though, don't forget to look at Roy Underhill's great series of books on traditional woodworking. Find a bench that makes your heart sing, you'll be happy to work that bench. What a surprise! Years ago I built the same bench and it has been languishing in a friend's basement because I had no place to put it. Just now I am moving into a small shop I have built and was wondering what kind of workbench to put in it. I already have it! It's all about learning to use what we have isn't it? Hope the bench works well for you! Cool Blog site. Enjoy the theme and topics, picts and all.